I found this microphone in a bag of trash close to a month ago. I brought it home and it didn’t work. However, a closer inspection showed that the inner wires had come undone and that it could be easily fixed. Yesterday afternoon my room-mate Maya and I teamed up and fixed it. I used a soldering iron for the first time and it was fun. I hope to improve my repair skills and learning how to solder seems like a pretty important step. With the wires now in place it works great! We tested it out with the karaoke machine I found. 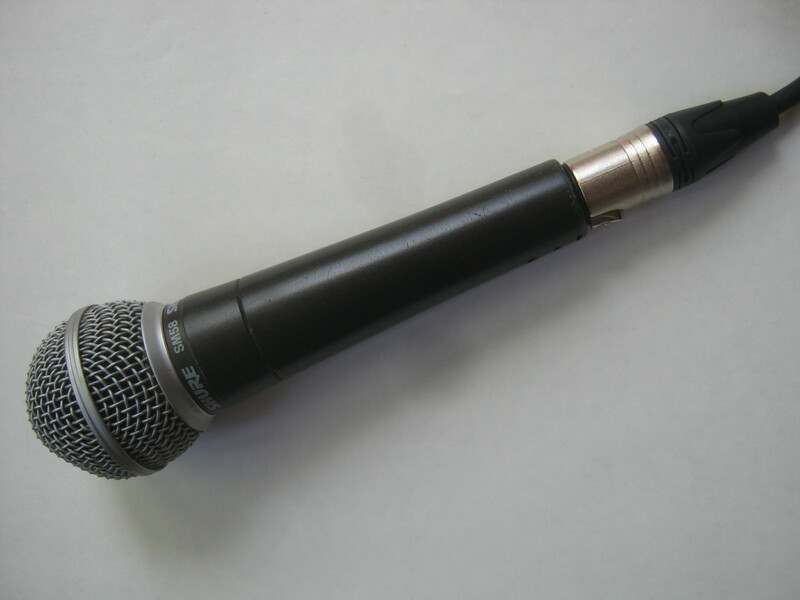 It’s actually a decent quality mic (a Shure SM58) which sells used on Ebay for 70$ or more on Ebay. I gave the mic to Maya because she’ll put it to good use. I also owed her a microphone because I broke her last one swinging it around like a rock star. This mic is apparently a fair bit better though, so everybody wins! Last evenings trash run wasn’t super productive. 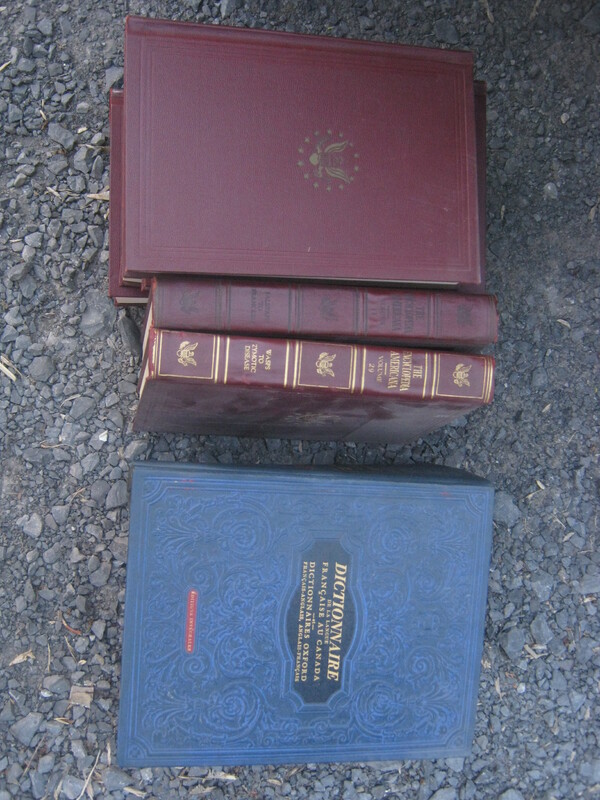 I found these Encyclopedia Americanas (from 1948) and a big French dictionary (from 1958) on Christophe-Colombe near Roy. I took the French dictionary but stashed the encyclopedias for someone else to find. There were just too many to bother carrying. Sometimes when I’m not attached to something I just leave it in my bike’s milk crate. That’s where that dictionary is currently. I’m not too worried if someone takes it. I stopped here for the skates, which I ended up leaving around Pizza Bella on Papineau (pretty good pizza by the way!). I opened one of the bags and found a few old electronics, including a walkman (one of two I found yesterday) and this little portable TV by Casio. I need a couple of AA batteries to test it out but it’s in amazing cosmetic shape and I expect that it works fine. I’m trying to figure out how best to quantify my goal of “living off garbage.” I think keeping track of my sales by month is a good idea, and I may go as far as to keep track of all my expenses as well (no matter how annoying this sounds as I write it). On the plus side, keeping track of all my expenses might motivate me to spend my money a bit better. I’m still living as if I was working, which basically means I’ve been getting way too many slices of pizza. I made about 25$ from a impromptu yard sale on Monday afternoon. Combine that with the 15$ I made from that silver perfume bottle and I’m up to 40$ for May. I should have some more sales soon and I expect this total to rise quickly. The iMac, shin guards, and sewing machine specifically should add a nice bump to this total. I need to get to work putting things on Etsy; I’ve been slacking on that front. There’s some money to be made from the jewelry I have sitting around. Next Post Bone, tusk, or neither? you can always sell your old electronics and metals for scrap. Turn your Garbage into Gold ! Actually, no. Consumer electronics has very little gold. Industrial/military equipment used to have some gold. Home computer stuff might have some gold, but the expense limits it. Gold is only valuable when there’s enough of it. The trivial amount that might appear in consumer electronics is offset by the need to process it. It’s no different from mining, you have to process a lot in order to get a bit of gold. The processors are gathering large amounts and likely paying little or nothing. It becomes worth their while if they can get enough free electronic equipment, run it through the crushing and then chemical process to recover the gold. They won’t offer anything for a stray piece of electronics (especially when they can offer to collect it on a much larger scale during some “e-collection”, and it would require a lot of electronics to get a bit of money. That’s what worries me. 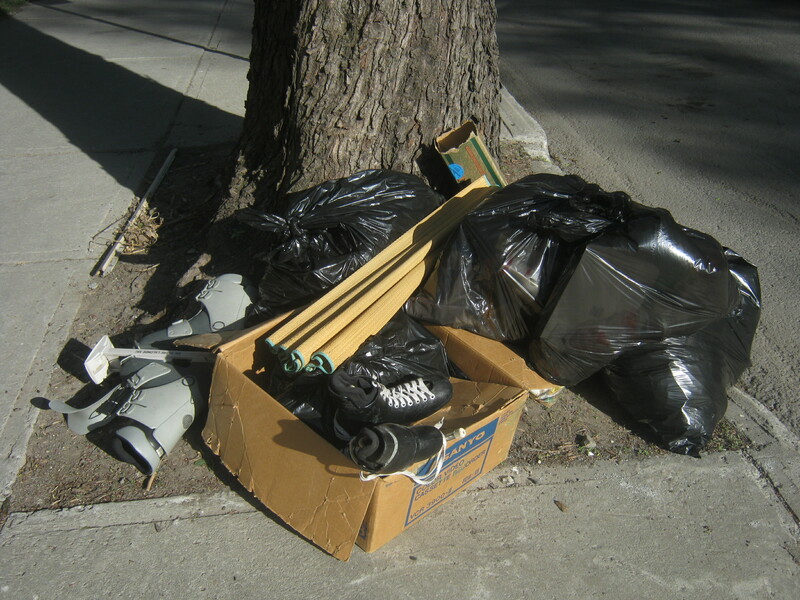 There was a toxic waste collection in Westmount on Saturday, and as usual, they also had a truck collecting “e-waste”. The recent computers, the iPods and other recognizable stuff will be skimmed off and get into the used market if it works. The rest, it’s just junk and will get processed for gold, what minor bits there are. 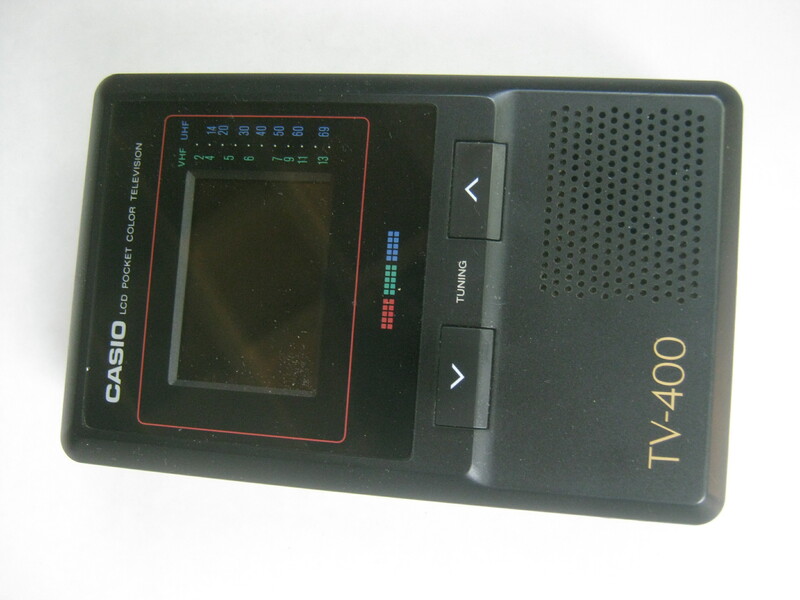 But something like that Casio portable tv set might be $5.00 valuable to someone who needs a small display (a collector might pay more), which is more than any gold recovered from it. I regularly take things apart for the parts, I get more value than the gold seekers. At least I strip it down, so the metal goes to recycling. people bought the accessories). But it requires a skill that someone looking for the latest and most familiar stuff won;’t have. It’s no different from the barcode skimmers at book sales, they have no skill, no ability to judge the value of a book, they are simply using the barcode reader and a smartphone to find the price online; if a book rings a bell, they grab it. People are promoting ideas that lack common sense. Instead of fussing about garbage in the McGill Ghetto, they should be complaining that the good stuff isn’t left by itself, to make it easy for others to harvest. There can be a good reason to keep electronic junk out of landfill, but it’s not gold that is the factor. The only way to limit what goes into the garbage is if people buy less in the first place. It never hurts to learn a new skill. Nice, chatty post. a current example of what your local scrap yard buys and up to date pricing. That is an interesting sample list. Likely they’ll offer $5.00 for memory cards and 2.25 for PCI cards because they hope at least some of it is valuable by itself, and they have a place to sell working items to. I’m sure they glance over the towers, pull out the recent vintage and resell it. Oddly, a tower can often have so much metal in the case that it may provide a faster accumulation of metal weight than other things on the list. A lot of stuff, like I said, has value before getting tossed as junk. I’ve pulled hard drives out of computers lying on the sidewalk, and they have more value as hard drives than scrap metal. Even lower capacity drives have really strong magnets that have more value than the scrap metal price. I did pay five dollars for an 80gig hard drive a couple of years ago, I felt I offered low, but I didn’t need it, and it was there on my return. Of course, some people don’t have the patience, or the resources, to get more than scrap prices. Scrap yards don’t have the time or manpower to check each and every piece of e-scrap received to see if it works for resale. They buy and sell hundreds and hundreds of pounds of e-scrap everyday. Even Best Buy and Future shop sell their unsellable or damaged electronic merchandise for recycling. Selling the items yourself to a scrap yard is better than throwing it out and leaking hazardous chemicals into the earth . The items get completely stripped down so that every reclaimable material gets recycled. We live in such a wasteful environment, by selling your unused or unwanted electronics for recycling, you are doing a service to the environment and making some cash at the same time. I don’t understand why you seem so against it ? Because it’s more valuable as is. That $5 GPS receiver I got at a garage sale has plenty of value, even if others don’t want it because it doesn’t do maps. Recycled, it’s going to provide virtually no value. It’s now easy to find LCD monitors, which generally need a bit of work in the power supplies. Repaired, they have way more value working than stripped down for the metal and gold. I’ve had computers since 1979, yet since 1989 I haven’t bought computers new. Some people think a computer a few years old is “obsolete”, in part because they don’t want to fuss “with technical details” so they let others tell them what they need. They can send their computers to “e recycling” thinking they are doing the right thing, when the computer likely still has value being used as a computer. If I strip down a cordless phone for parts, I get more value out of it than when it lands as scrap. It has minimal metal content, likely no gold, but I can pull parts out of it that would cost me money if I had to buy them. Something still working, or easily repairable, has more value kept on being used than as scrap. Using it as a source of parts has more value than breaking it down into tiny bits of metal. It also means that someone can pay a small amount and get what they want/need, rather than having to buy something new and pay full price. That 60gig iPod I found in the garbage, all it need is a battery to get going. I think the owner decided he couldn’t fix it himself since there was a soldering iron right next to it. It has way more value repaired than as scrap metal. I don’t like the idea of people who don’t know enough deciding that their electronics has no more value and should be treated as scrap. If they toss it in the garbage, or leave it visible, it has more chance of being used as is than if it’s “recycled”. This is no different from so much of the “neat stuff” found in the garbage, except since most people can’t evaluate electronics, it becomes invisible to them, and thus magically should be sent to recycling. People don’t say that about furniture or books, they say “this stuff should be reused”. Someone suggested electronic scrap as a source of gold. I pointed out that electronics has more value at a garage sale than a scrapyard will offer, and you proved my point by posting that price list. I go to garage sales looking for interesting electronic stuff, sometimes I may be the only one passing by all day who’s interested. But even paying 75cents for that trackball last year, or the 2.00 for the scroll mouse or that 2.00 for that musical keyboard , “it doesn’t work”, gave the owners more than they’d get by sending it to ewaste recycling. The same with rummage sales, I’ve gotten all kinds of things that if they’d not been given to the rummage sales would have been “recycled” and the donator would get less than the sale gets. And it seems like I find less interesting stuff at rummage sales, they not being able to evaluate it and thus consider it junk, so they get not even a few dollars for it. I should point out that this is exactly what’s happening with the larger used book sales in town, they want to maximize profit so they scrap endless books before the sale. I should at least have a chance to look over the books before they are discarded. As for the junk dealers, I am making the point that they will pull the obviously useful things out before scrapping it, to optimize their profits. So someone tosses their “obsolete” MP3 player (Pizza Pizza had a deal last week where you could trade one in for a slice of pizza) into “ewaste recycling” and if it has noticeable value, it’s going to be resold. Might as well do it yourself and leave out the middleman, since the middleman won’t give you anything much for it. The one interesting thing about “e-waste recycling” is that the owners don’t have to worry about those pesky people poking in the garbage and making use of their electronics for free. Better to scrap it all than let someone have some value out of it.